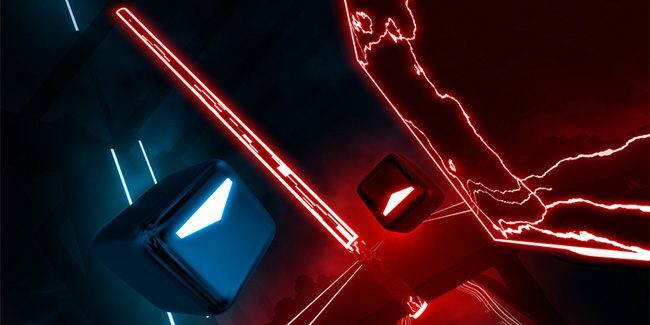 According to an official Oculus blog post, Beat Saber will be available on day one of as part of the Oculus Quest launch lineup and will deliver the same great, highly-addictive experience that fans of the Rift version of the beat-slashing rhythm game expect and come to love. The Oculus Quest standalone headset with its fully wireless six degrees of freedom (6DoF) will play a significant role in enhancing the overall Beat Saber experience, allowing users to be able to move much more freely and with greater accessibility than ever before, thanks to no PCs or cables needed to tether to the headset. The announcement also comes as Beat Saber recently just reached a major milestone by having sold more than one million copies of the game across all platforms in less than a year. This certainly makes this VR rhythm game title an important addition to the initial Oculus Quest lineup. Alongside Beat Saber, there are about 50 other titles planned for the Oculus Quest launch—including Robo Recall, Dead & Buried, and Superhot VR, just to name a few. No word yet on an official Quest release date, but stay tuned!